Almost over night it seemed Spring had spelled the hawthorn tree in the hedge and great clouds of white blossom ruffed its branches. The notched leaves witched to a bright leathery green. The anthers are red, like the head of a match, so each flower resembles a speckled bird’s egg. Now, in mid-summer, clutches of small green berries hang on tightly and, as summer ages will, like traffic lights, turn to amber and then red. This is not the enamelled red of rowan berries or the polished sheen of rose hips but a modest, sombre red. Old ballads and legends tell that the hawthorn is a tree of mystery and enchantment, a faerie tree. It is said the crown of thorns with which Christ was mockingly crowned was made from hawthorn. In the Lady Chapel at Ely there is a carving showing Mary with her Child set against a background of hawthorn leaves. Mary holds one haw, a sign of what is to come for the Child. At some Palaeolithic cave dwellers burial sites, the bodies have been found wearing similar crowns of hawthorn. The hawthorn tree is believed to be a dwelling place for faeries and an entrance to their country. An ancient ballad from the Borders tells how Thomas the Rhymer or, True Thomas as he is known, sat under a hawthorn , known as the Eildon Tree and the Queen of Faeries rode by in a dress of ‘grass-green silk’ and on her steed’s mane ‘hung fifty silver bells and nine’. She dares him to kiss her lips and, of course, he does. Westminster Abbey is built on what was known as Thorney Island in the River Tyburn and named after a sacred stand of hawthorn trees. Edward the Confessor built a church here and the present building altered and added to by other monarchs was built originally by Henry 111 in 1245. Henry vii chose the hawthorn as his emblem after the Battle of Bosworth as the crown worn by Richard iii as he rode to battle was found in a hawthorn after Richard was killed. Henry, the first of the Tudor dynasty, received this crown on what is known as Crown Hill. A small tree, a hedge tree, gnarled, twisted and thorny, crabbed. It bends and knots, spiky bones knitted together against wind and weather. The OUD’s definition of ‘graffiti’ is ‘a piece of writing or drawing scribbled, scratched or sprayed on a surface’. The symbols, writing and sketches scratched onto church walls some five to seven hundred years ago are a different kettle of fish and, because nowadays we tut-tut at graffiti, thus it seems a different word really needs to be used. Some of the images are intricate and would have taken some time to scratch into the stone and were done in the body of the church for all to see so they were viewed in a quite different way, acceptable, respected and allowed by the Church. Norfolk and Suffolk have about 1 100 mediaeval churches and in 2010 a survey of the graffiti in these started in Norfolk, it was the first county to do this. A similar survey was started in Suffolk a few years later and has spread to several other counties. Stained glass windows, brasses, ornate tombs, monuments in churches speak of the lord and lady, the well-to-do, those of influence and power in a parish but where are memorials to the common man? Where is the tinker, the tailor, the poor man, the thief? In mediaeval times, roughly from the end of the Roman Empire to the Reformation of Henry viii, everyone had a very well defined place in society, from king to knave everyone knew their place. This is demonstrated in the ‘Boke of Seynt Albans’ written in the 1400’s, hawking was very popular but, depending on one’s position in society one could only own and fly a particular breed of hawk. Only a king could fly a ‘gerfalcon’, ‘there is a spare (sparrow) hawke and he is a hawke for a prest’ and ‘there is a goshawke and that hawke is for the yeman(farmer)’and that well known one used as a title for a book and then a film, a kestrel for a knave. The graffiti which in some churches cover, wall and pillar, arch and sill could have been done by poacher, ploughman or shepherd, are these graffiti the memorials to the ordinary villager? Interiors of churches of hundreds of years ago were brightly painted with pictures of saints painted directly on to the walls. The graffiti were done with care and intent, what was their original purpose, were they prayers, charms, protection? The Church taught that at death the soul went first to Purgatory to pay for sins committed while on earth before entering heaven so perhaps some graffiti were to a saint to intercede for their soul and the more time and devotion given to carving a symbol the greater effect it would have. ‘Fire and fleet and candle lighte / And Christe receive thy soule’. Why were ships cut into the stone in inland parishes, was this to wish that it would give safe passage for a soul on its last journey? Latin prayers, names, geometrical circles and patterns, crosses, heraldic inscriptions and even architectural plans can be found. It was believed that devils lurked round every corner to tempt the human soul so were some of the graffiti for protection? Names too were cut into the stone, ‘John Lydgate made this on the day of St. Simon and St. Jude’ (28 October), this is thought to date from the late 1300’s to early 1400’s. Records in stone of all our human frailities, love, hope, death and fear, the daily perils of an ordinary life. Many of these graffiti are time worn and it needs a very sharp eye to see them. Just think, to be able to stand where someone else stood five, six, seven hundred years ago and touch the symbol he carved is to be hand in hand with him. 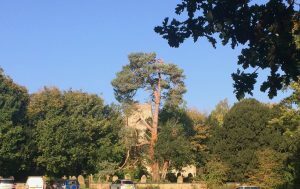 Stand facing the south porch of Bergh Apton church and then turn and take three or four giant strides to your right and you will reach the north wall of the transept. The wall is made of flint and the quoins of limestone. A wall built of flint and rubble would have an uneven edge at the corner and wet and frosty weather would soon erode so quoins, which are cut blocks of stone, were used to give stability and protect. Today quoins are largely merely decorative. About four or five feet up on one of these quoins are groves, a few inches in length and radiating from a central point where the gnomon used to be, this would probably have been a nail and is long gone. The right hand side of the quoin was broken at some point so the lines on that side have nearly disappeared. I used to think this was what is sometimes known as a scratch dial, a simple sun dial. I am reading ‘Medieval Graffiti’ by Matthew Champion and I now know these are correctly called Mass Dials. The early ones were generally just straight lines but later ones included numerals and quite complex decoration. There are several thousand of them to be found in churches all over England. One theory is that they were used to show the approximate time of church services. In Mediaeval times life was planned between the rising and the setting of the sun and dominated by the Roman Catholic Church. Prayers were said through the day beginning at Matins which was before dawn and then Prime, Terce, Sext, None, Vespers which was at sunset and Nocturnes after sunset. As in our day church services were announced by the tolling of a bell so there was no need to put aside whatever task was in hand and hurry to the dial to see if it was time for a service. Some of these dials are found on the north wall of a church so of little use there. Dials were usually scratched near the porch of a church but some are found inside which would indicate the porch was a later addition. In some cases there are several of these dials scratched into the stonework and close together, why would several be needed? There is no real answer as to what these dials were really used for. As far as I know no other examples of graffiti from six or seven hundreds of years ago can be found in Bergh Apton Church. So, in other ancient churches who scarred the walls? Was it perhaps the ploughman who scratched a fire breathing dragon on the wall in the nave? Did bored choir boys scratch demons and devils in the chancel? Perhaps the Lord of the Manor used his knife to write a love charm just inside the north door? Heraldic shields, knights, birds, fish, music, architectural plans all can be found. With the passing of time these graffiti now are worn but in Mediaeval times churches were brightly painted and must have been a joy to eye and mind and imagination and any angels and coats of arms and knights in armour and plants scratched through the paint to show the stone beneath would have been clearly visible and appear to have been respected and in some cases added to. Modern grafitti is generally a kicking of the voiceless against what is seen as an uncaring society, it is seen as undesirable but the graffiti of hundreds of years ago were perhaps a devotion, drawn and scratched by a people far more at home in their churches than many of our generation.